Keep­ing track of old ver­sions of your work is one of those things you don’t appre­ci­ate until you have it. Most peo­ple keep old ver­sions with a mish­mash of file names (novel.doc, novel-backup.doc, novel-backup2.doc, novel-backup-september-2015.doc, …) or using a ser­vice like Google Dri­ve or Drop­box. These solu­tions work but to say they’re lack­ing is an under­state­ment. Enter git. Since I use LaTeX all these con­di­tions are met (most word proces­sors have an option to store con­tents in flat files which gets you most of the way here). 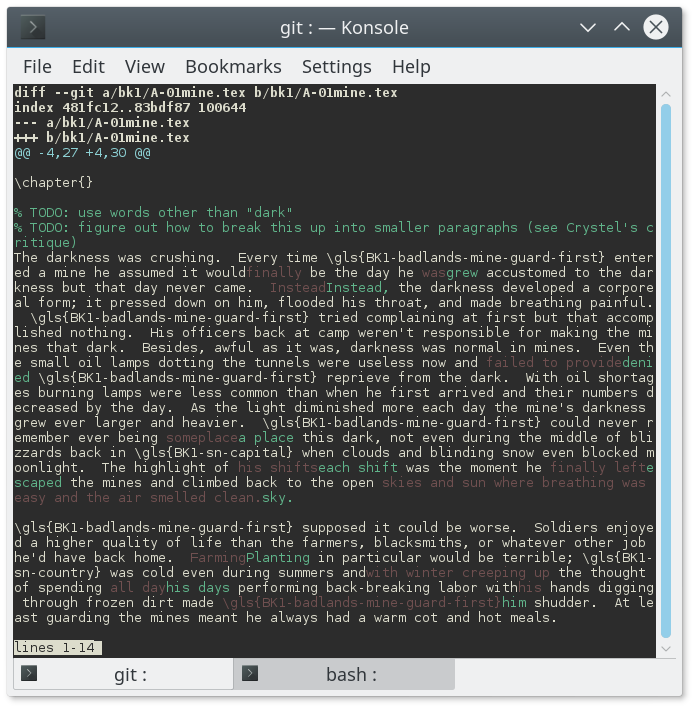 So how use­ful is git? Think about the back­ups spread across dif­fer­ent ser­vices and fold­ers with God-only-knows what names. Count how many you have and com­pare it to the his­to­ry of my project. Not only is back­ing up off­site triv­ial, but each back­up con­tains the entire his­to­ry of the project. As of right now my entire repos­i­to­ry, mean­ing the full his­to­ry of my project, is a whop­ping 652 kilo­bytes; less than half the space of a flop­py disk. You can also mark spe­cif­ic ver­sions with sym­bol­ic names (the git term for this is a tag). This makes it triv­ial to see what changed between two dif­fer­ent ver­sions. In fair­ness git has a learn­ing curve and last time I checked most gui tools ranged from awful to bad (cowork­ers assure me this has changed). A sim­pler option is mer­cu­r­ial and Joel Spol­sky put togeth­er a sim­ple tuto­r­i­al for any­body unfa­mil­iar with ver­sion con­trol. It’s not for every­body and I haven’t test­ed git with pop­u­lar tools Scriven­er but if it fits in your work­flow give it a go.